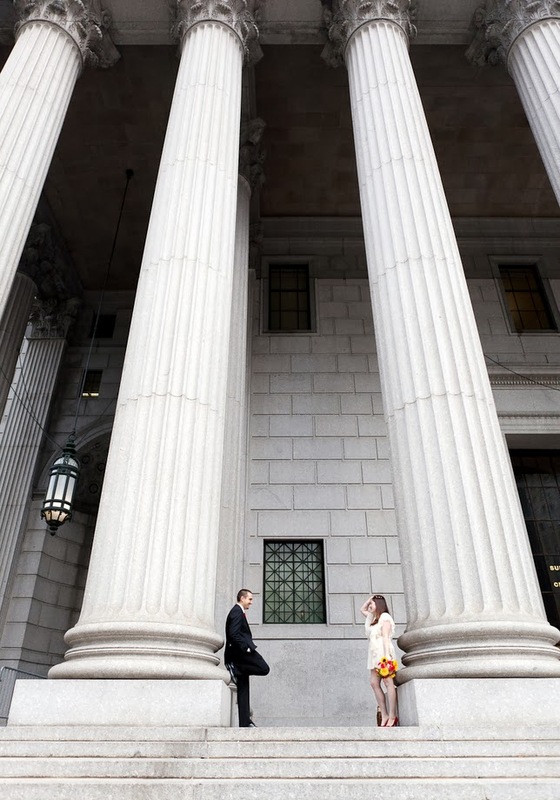 This photo, taken by Alice outside of the Manhattan courthouse on our wedding day, is one of my favorites. Probably because I look tall. Tiho and I decided to splurge on a European vacation this coming June. So far, the plan is this: two weeks split between London, Paris & Barcelona. (We just booked this beautiful hotel in Le Marais district of Paris!) A three-years-after-the-fact honeymoon. I honestly have no idea how our life will look in three, six, twelve months from now, so we're focusing on this trip as a celebration of the two of us. I hesitate to discuss marriage here, because #1). I'm no expert, and #2). it's my marriage, and frankly, why is that of interest or importance to anyone else? But (of course there's a but, duh), I really love being married. In my opinion, I married young (twenty-five). In New York, that's not really typical. A lot of people I know spend their twenties building a career and wait to get married until their thirties. I think that's great. But, for me, marrying at twenty-five was the right decision. I have never been as sure about anything as I was on the day Tiho and I committed to love and support each other unconditionally as husband and wife. I'm really glad we married when we did, because it gave us a few years together to build a solid foundation for the rest of our lives before bringing children into the picture. We aren't perfect. We make mistakes and argue and have bad days and leave piles of dirty dishes in the sink and drive each other nuts sometimes. But, at the end of the day, we are genuinely happy to be with one another. I'm certainly not qualified to offer advice on building and sustaining a happy marriage. All I know to be true is this: My marriage is the most important thing. So far, that's the only insight I've needed. PS–those are some fabulous legs in that photo! Beautifully expressed and so vulnerably written. Bravo to you and Tiho. And I second that: "Fabulous legs in that photo!" Your sentiments are both beautiful and true. I'm excited for your upcoming travels! I'm staying in the Marais next week...leaving tomorrow, eek!